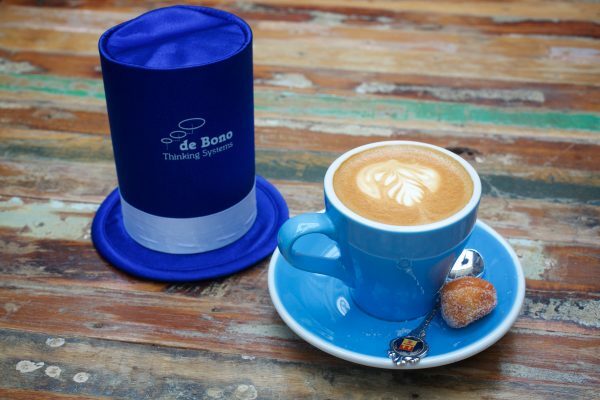 A woman walks into her favourite café for a coffee and leaves with a blue hat - Goggles On! A woman walks into her favourite café and sits at the bar stool closest to the La Marzocco coffee machine. She orders her usual drink from the attentive barista and sits quietly waiting, fidgeting with her phone, looking for the answer to something. How is your Monday panning out? Asks the barista. She hesitates, scans around to see if anyone is within hearing distance, and offers: All good. Unconvinced the barista, while noisily grinding the coffee checks in again. Yeah, you sure? The woman who walked into her favourite café, pauses then puts her phone away. I’ve just come from another meeting at work, we just seem to have meetings for the sake of meetings, but nothing ever happens in them or from them. I don’t know why I bother going, except that I have to! As he presses the Tanzanian Single Origin into the filter holder, he looks up and asks two simple questions: Are you here all this week? (meaning will you be in each day for you regular). Yes. The woman answers with a raised eyebrow. Is this an ‘Always’ problem that you want help fixing? Well, yes if I can? But….. He stopped her there raising his pointer finger on his right hand. Wait there for a second. The barista disappeared out the back of her favourite café and came back with a tiny blue top hat and a tiny white top hat, about the size you could imagine the Cat in the Hat wearing. He placed them on the counter. What are those? She quizzed. These are Thinking Hats, to be precise this is Blue Thinking Hat and this is the White Thinking Hat. O…..K……?? He disappeared below the counter as he grabbed milk for frothing for her coffee. As he started to froth the milk he said: Right so we have 5 days to consider your challenge at work, today being Monday through to Friday. I have 6 of these Thinking Hats, all different colours, each hat representing different modes or ways of thinking. If you’re keen, in the few minutes we see each other every day, and perhaps the occasional interruption from other caffeine addicts, we can tackle your meaningless meetings challenge. Keen? A little taken aback by an offer to help from the barista in her favourite café, the woman was intrigued enough to give it a go. Let’s do it. The barista presented the coffee of choice to the woman and pushed the blue hat closer. Right the blue hat is the one we will use to manage our thinking. It’s like the hat that helps set up the rules, the facilitator. It will keep us on track over the next week as we look at your challenge. So we will use the blue hat to get and keep us focused. A little unsure about the tiny top hats, the woman sipped from her cup and nodded. Sure. If we were to develop a focus statement, I guess like a solution statement, starting with “How to…” for this challenge what could that be? They played around with some wording and came up with: “How to have productive, meaningful team meetings”. Right it’s a little broad, but let’s start there. Next how long do we want to, or can we, spend on this challenge? Yep – um, well as you said every time I come for a coffee, I guess if we could spend 5 minutes each time I’m here, that gives us 25 minutes. Done. I’ll keep an eye on the time for both of us, and if you can take whatever notes you think will be helpful? OK OK Now you don’t know anything about these hats do you? She shook her head. They’re Edward de Bono’s Six Thinking Hats®. To use them properly we should choose a sequence for working with them. The Blue Hat needs to be used to set up the process or meeting and also to close it. The barista grabbed some felts offered to children when they came to the woman’s favourite café. He drew a blue hat on a piece of paper at the left hand side and a blue hat on the right hand side. We’ll then use the white hat, followed by red, black, yellow and green. He drew these in quickly, checking the time as he did it. OK, so we’ve had our five minutes today, but tomorrow I’ll introduce the white hat, and the red hat. Have think about what you know about the meetings, what you don’t know, and where you could more information about the meetings Do you mean, like why we have them, how long they are, when, where and so on? She checked. Yep, perfect! Also think about how this meeting makes you feel, your gut instinct every time you turn up. Well, don’t get me started…. He put his hand up. I won’t for now, but bring those thoughts and feelings tomorrow and we’ll have another quick thinking hat session. Thank you! See you then. The woman walked out of her favourite café thinking about what had just happened in her coffee break.